Quarterback Tony Romo moved gingerly through the DFW Airport parking lot late Sunday night, from the neck-up focused on following up the Dallas Cowboys’ win in Washington with a playoff berth but from the neck-down planning Monday to get an MRI on his back. "I tweaked it in the game," Romo said after Dallas’ 24-23 win over the Redskins, highlighted by his scrambling game-winning pass to DeMarco Murray in the final minutes. "For whatever reason, just the twist or whatever that was, definitely just made it not feel comfortable." 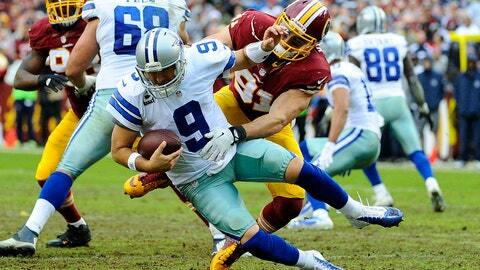 Romo is vowing to play next Sunday night in the NFC East "title game" against the visiting Eagles. All involved say the back "tweak" is unrelated to the cyst surgery on his back that Romo underwent last spring. Meanwhile, he may also have a leg or a foot problem deriving from contact in the Redskins game. Coach Jason Garrett said the QB may have gotten "leg-whipped." Meanwhile, owner Jerry Jones â citing Romo’s toughness â said pain is something the QB deals with regularly, and well. "He’s a tough man," Jones said. If the Cowboys win in Week 17, they win the NFC East and will host a playoff game on wild-card weekend. If they lose, they would finish 8-8 for the third straight year â having lost "NFC East title games" in 2011 to the Giants and last year to the Redskins.